then put a check in the box that says "show my email address" (it only shows up when someone is trying to answer you from their email, so they can respond back. the last and most important step is to go to the bottom of that page and click SAVE. Hope this helps...if not, here's a picture for your question. 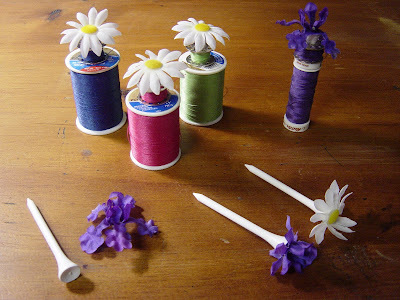 I glue silk flowers to the tops of golf tees. The tees then keep the matching bobbin together with the spool of thread. OOOOO what a fab idea, I'm off to raid DH's golf bag - shhhhh don't tell him. Incredibly fertile imagination you have there -- thanks for sharing all your tips! Ah! Ah! Another good reason to stay married to a golfer ...... I don't like my chances of getting the golf tees in a divorce settlement! Great blog Karen. Lovely pictures and nice ideas! Love the golf tees!! Great idea to hold in the coordinating bobbins. Send the golf tees idea to Fons and Porter. You could win a magazine subscription if they share your tip. It is a great one! OMG! Thank you. What a great and simple idea. I have been hunting for the answer to keeping these together. I am off to raid my DH's golf bag. Hi Karen, I got your comment for the "no reply" email issue. I have set up a separate email account just for this blog, so hopefully this problem has been solved. I love looking at your blogs. The golf T's for bobbin holders is genious. I have those small little blue things, forgot their name, which does the job but it doesn't look as pretty. And I love how you have your sewing room. I wish mine was as clean and organized as yours. Last year I revamped my closet (one of those standard accordian closets) to cram as much stuff as I could in it and it works, I got a lot of stuff in there but I would love to have something like you have. You are my inspiration for my next sewing room, lol. Oh, I forgot to ask. What is the labels bar for and how do you get it. Is it like a contents page for your blogs so people dont have to go searching thru each month's blogs? THANK YOU for letting me know that my email was set to No Reply. I believe that I have fixed it. Thanks for the encouraging words as I start this adventure! I went to my profile and changed it. I hope it works now. Next, I want to learn how to put a picture across my header. Do I have to have a blog to get a reply?? Thank you for the tip on the No Reply settings!!! I always wondered how to set that up!! !